This design of roof was produced by Devon from the beginning of the bay window in 1968 until about 1975 when it was superseded by a one piece fibreglass type. 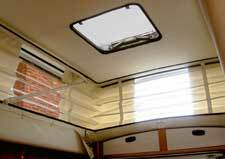 It consisted of a fibreglass plinth that was attached to the roof of the van and a shallow elevating roof attached by spring loaded triangular side supports which when extended hold the roof up. The roof has a concertina style bellows, early models being made in white plastic and having clear window sections one at both the front and the rear and two clear sections either side, this was changed to a plain white bellows with no clear portions in the early 70's, both concertina bellows were in a plastic material with internal rods to give it support and straps to limit the upward movement. The bellows is attached by aluminium strips that screw into the fibreglass plinth at the bottom of the bellows and by aluminium strips that rivet to the top section of the roof , (it should be noted that you may find the bellows is attached by clips to a separate rail as devon produced a spot welded roof for the last year of production). 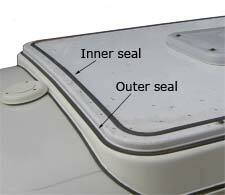 The roof has a central aluminium portion that is supported by a riveted framework that gives the roof its shape and supports the vinyl headliner, this central portion is connected by a joining seal to the outer aluminium frame this attaches to the triangular side supports, there is a single vent in the roof. We produce exact copies of the concertina bellows in both a plain white plastic or in white with 6 clear windows, 2 either side and one in both front and back, they are supplied with new straps that limit the amount the roof can be lifted, it is necessary to use the internal rods from the original bellows and fit these into the bellows with the new straps. We also produce a replacement bellows which follows the design of later devon and several other roofs , this having flat sides and ends using the sides to limit the upward lift (no straps or rods to fit). The main disadvantage of this type of bellows is when lowering the roof, the bellows will not fold neatly like the concertina type, it needs bunching up and tucking in around the outside. 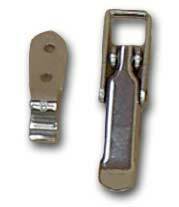 However we have made lots of these and the advantage is the price and their ease of fitting. There are two seals on this roof both found on the elevating part, a joining seal that connects the central part to the outer frame and the outer lip seal that fits into a groove on the edge of the frame. 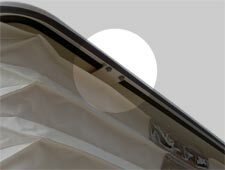 The headlining is held to the inside of the roof by being stretched over the inner frame, it is held in place by C clips around the edge, it is then made neat by a black edge trim. The standard vent fitted to the roof consisted of an aluminium frame riveted to the roof, the lifting brackets are attached to a plastic vent cover, our replacement covers are in white and come ready drilled with the four attachment holes and rubber grommets for these holes to prevent cracking, the seal on these vents fits into a groove in the vent frame. These roofs have a tendency to leak, this is almost always past the rivets, having rebuilt many of these over the years we have found a solution which has been well proven to work. We replace all the rivets in the top of the roof, strengthen the inner framework with extra rivets and triangular brackets to give a solid structure then glue a vinyl topping on this central part. We fit a new joining seal then inject sealer between the seal and roof topping, and a bead of sealant under the vent frame before refitting over the roof topping. 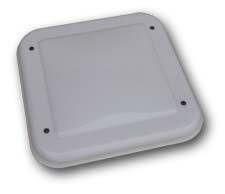 We can supply new hold down catches for this roof made in stainless steel rather than the original chromed steel. Also the top corner brackets that connect the triangular side stays to the elevating frame have a tendency to rust through, we have a kit consisting of the four corner brackets and relevant nuts and bolts to refurbish them.